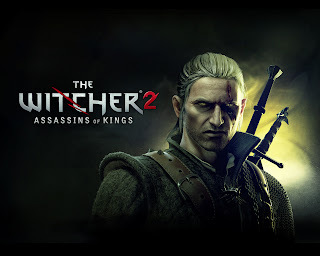 Taking a break from my typical Bethesda loving self I decided to pick up a RPG that was suggested to me by a friend by the name of The Witcher 2: Assassin of Kings. The Witcher 2 features a character by the name of Geralt that is falsely accused of assassinating the King he was protecting. Without spoiling too much of the story I'll just tell you that you end up going on a quest to clear your good name. This is all done with the support of characters who I imagine are from the previous game which I did not play. However the story flows well and allows the player to jump into the characters and the game without really having a lot of knowledge of what happened in the previous story. To that end the game does a really good job of keeping you engaged and interested in the events that are unfolding around you. I really really don't want to spoil any of the story so I will depart from that aspect of the game just saying that it is rather enthralling. The game play is somewhat...problematic at times. Your character at any time has two swords, a silver sword and a normal sword. The silver sword is for fighting monsters and the normal sword is used for fighting people. On top of that you can also equip one ranged weapon (bombs or throwing knives) as well as one spell (these come in the form of signs). You can swap between spells and ranged weapons fairly simply by bringing up a radial menu that slows combat to a crawl. I say it slows combat because it doesn't really stop it, while you are taking time to pick items the combat is still moving forward. It seems to be like an on command sort of bullet time for the sake of ability swapping. That being said aiming these ranged weapons and spells can be a rather clumsy affair. Certain spells and thrown weapons tend to miss completely unless you manage to center yourself perfectly on your opponents. This becomes rather problematic when much of the combat has a lot to do with rolling in and out of combat and executing quick counter attacks to your opponents or at least that was the idea. I found that in most scenarios where an opponent was exceedingly strong you could just mash your quick attack button until they fell over. Some of the later enemies just involved a lot of running around, quick striking and then running back in. Needless to say the combat left something to be desires. Despite the flaws of the combat there were several mini-games like dice and the alike that were fairly entertaining to help break up the combat game play. Though I'm still not entirely sure how the arm wrestling worked but I think it had something to do with the mouse. There are also several instances of fist fights which are broken down to Quick Time Events. When E appears press E, when A appears press A, etc, etc. QTEs are something I really dislike and for some reason they felt rather out of place in the game. Every time a fist fight broke out I felt agitated having to go through the annoying mini-game. The game also features crafting via vendors and yourself. Geralt is capable of performing alchemy in the field by meditating which lets him make potions. Problematically this is the interface you also have to consume potions in and you can not use it while in combat. This means that if you have a potion that helps you slay wraiths then you need to guess that there are wraiths coming up to use the potion before you enter combat with them. This means that you go into an area, die horribly to a monster once and then reload so you can drink the appropriate potion and then enter the room to fight said monster. Having to sit down and concentrate to drink a damn potion was extremely frustrating and annoying. There were also a ton of useless potions that you could make that seemed like that they were just there to add some false depth to the system. The vendor crafting was how you managed to make weapons and armor. Essentially you would have to go buy a pattern, find the materials and then find an armor smith to make the item for you. Often going out to find the items you needed to create the item you wanted resulted in you finding something that was better than what you were trying to make. Essentially both crafting systems were sort of... frivolous. Despite these flaws the game is fairly solid and allows you to explore an interesting story that has enough depth to it to make up for some of the more frustrating features of the game. A relatively short review for an all around entertaining game. Ultimately I'd say it's worth the money.